David Stockman: "This Time Is Completely Different...But Not In A Good Way"
If you don't think the stock market is a giant accident waiting to happen, just consider the two most crucial developments----soaring stocks and soaring deficits--- since November 7, 2016. First, on the lunacy side of the equation, the S&P 500 was up 35% at its 2873 peak on January 26, and now the dip-buyers, chart-readers and robo-machines are trying mightily to retest that level after the short-lived 10% correction at the turn of the month. But here's the thing. The pre-Trump market at 2130 on the S&P 500 was already trading at a nosebleed 22.4X LTM earnings of $94.55 as of Q4 2016. Consistent with the pig-through-the-python profits mini-cycle of the last four years, which flows from the parallel commodity/industrial/trade cycle, LTM earnings for Q4 2017 have now come in at $106.84 per share. Down on Wall Street they are calling this gain a 13% Y/Y earnings rebound that justifies rising stock prices, and even buying the dip at current levels. To the contrary, we think the whole earnings growth narrative is nothing more than mullet bait; it snatches a one-year delta from the underlying trend and macro-context and thereby generates an utterly misleading conclusion. The truth is, S&P 500 earnings are now back to where they were 39 months ago when they posted at $105.96 for the September 2014 LTM period. We'd call an $0.88 gain over more than three years a rounding error, not a sign of resurgent profits. We'd also call the implied LTM multiple of 26.9X at the recent 2873 top just plain crazy. That's because the current business expansion at 104 months is over and done for all practical purposes: The post-1950 average is just 61 months and the historic record is 119 months under the far more propitious circumstances of the 1990s. In that cyclical context, the historic record leaves little doubt about the foolishness of pricing the stock market at peak PE multiples during the final innings of the business cycle. For instance, in September 2007, the S&P 500 stood at 1530, where it was valued at 19.4X LTM earnings. At that point the business cycle was 70 months old, and the Great Recession technically incepted 3 months later in December 2007. The foolishness of the so-called "goldilocks market" in the fall of 2007, therefore, is not hard to dispute: Within 18 months, recessionary earnings had collapsed by 90% and the S&P 500 had lost 55% of its pre-recession peak value. The story at the March 2000 dotcom peak is even more telling. At that point, the longest business expansion in history was in month #109, and the S&P 500 was trading at 29.4X LTM earnings. During the next two years, of course, earnings fell by 50% and the S&P index dropped by 47%. Moreover, there is a further dimension of the cyclical trend story that is even more crucial. Back at the peak of the dotcom cycle in 2000, the 10-year peak-to-peak earnings growth rate had been 9.5% per annum----providing at least a modicum of justification for current stock prices. Likewise, at the June 2007 peak, the 7-year peak-to-peak earnings growth rate had been 6.8%. By contrast, the 1o-year peak-to-peak growth rate during the current cycle computes to just 2.3% per annum. In other words, we are now at nearly the same cycle duration as in March 2000 (month #104 vs. #109) and at the almost the same insane PE multiple (26.9X vs. 29.4X), but these current unsustainable valuations are coming off a dramatically weaker performance trend. In fact, the current 10-year earnings growth rate of 2.3% is just one-fourth of that recorded during the tech boom of the 1990s. So it would be fair to say that the Trump Trade is already way over its skis, and that's before we consider the "Trump" element of the equation. That is to say, the self-proclaimed King of Debt has now panicked Imperial Washington into an utterly lunatic fiscal binge at the very tail end of the business cycle, which will result in a 6% of GDP or higher borrowing rate. That represents the exact opposite of the relatively benign conditions which prevailed when the market was last at these valuation extremes exactly 18 year ago. In fact, as shown in the chart below the Federal budget was generating a 2.3% of GDP surplus during Q1 2000, and the public debt at 57% of GDP had actually declined considerably from 64% in the mid-1990s. In other words, Washington had used the great (but unsustainable) tech boom to get its fiscal house in a semblance of order. By contrast, the most polite way to characterize policy during the so-called expansion of the Bernanke-Yellen era is that Washington looked a gift horse in the mouth and then blew its head off. The 10% of GDP deficits during the Great Recession caused the public debt to swell from 63% of GDP in Q4 2007 to 83% by the bottom in mid-2009. But as the blue line in the chart makes clear, a combination of the tepid GDP and associated revenue rebound and profligate spending policy meant that the deficit made a lower low at negative 3.0% of GDP before heading south once again. Stated differently, compared to a 3% of GDP surplus at the 2000 peak and a 1.1% of GDP deficit in 2007, Washington kept running rivers of red ink through the entire nine-year expansion---with deficits now soaring before the next recession has technically even commenced. Thus, not shown in the chart below is the fact that the deficit during this year (FY 2018) will hit $1 trillion and 5% of GDP and $1.2 trillion and just under 6% of GDP in the year ahead (FY 2019). Moreover, the signature of the King of Debt and a desperate Congressional GOP is all over those baleful prospects. To wit, the inherited deficit for FY 2019 was $700 billion or 3.5% of GDP and reflected the permanent deep deficit policy adopted by bipartisan consensus after the debt ceiling crisis of 2011. That ill-advised policy alone meant that through the entire expansion cycle the public debt ratio continued to rise---unlike in the two prior cycles shown below---thereby reaching 103% of GDP. But another $300 billion (including additional interest) has now been added to the annual red ink by the asinine Trump/GOP tax cuts; and on top of that has come a further $200 billion owing to the bipartisan spending spree for defense, domestic appropriations, border control, disaster relief and ObamaCare premium bailouts that have already been enacted or are pending near term action. Accordingly, the public debt will likely reach $22.5 trillion and 110% of GDP by the end of FY 2019, and, as we have shown repeatedly, it is off to the races from there. Even without another recession through the end of FY 2028----which implies the absurdity of a 20-year rececssion free span---the projected cumulative ten-year deficit now totals $15 trillion, which would take the public debt to $35 trillion and 140% of GDP by the end of the period. In this context, what we meant by the "gift horse" is quite simple: That beneficent financial creature temporarily resided in the Eccles Building and by virtue of $3.5 trillion of bond buying after the crisis, it permitted the fiscal eruption displayed in the orange line above to be absorbed with minimal short-term fall-out on both main street and Wall Street. That is, there was no "crowding out" of business and household spending because the Big Fat Thumb of the Fed and other central banks kept interest rates drastically suppressed; and Wall Street was in clover, too, owing to rock-bottom cap rates (i.e. nosebleed PEs) and the massive outbreak of financial engineering in the corporate C-suite financed by a record explosion of cheap corporate debt. Alas, the end of the Bubble Finance road is nigh because the gift h0rse has been put out to pasture. Based on today's Fed minutes, there can be no doubt that the delusional Keynesians who occupy the FOMC will remain resolutely on the path of interest rate normalization and balance sheet shrinkage (QT). They are determined to have dry powder when the next recession comes knocking on the door of the Eccles Building, yet fail to see that the current "full-employment" economy is not all that. In tomorrow's post we will elaborate on the striking implications of the chart below. It shows the true state of the US economy and why the current narrative about resurgent growth is just another false positive. To wit, the gross output of the US economy has grown by just 2.4% per annum since the pre-crisis peak in Q4 2007, and manufacturing output by only 0.84% per annum. And these figures are in nominal dollars! More importantly, the cyclical undulations under those punk trends have been almost entirely a function of the global commodity/industrial/trade cycle. Yet the latter is once again turning south now that the coronation of Mr. Xi is complete and the Red Ponzi is again attempting to tame its $40 trillion credit monster. So what comes next is not reflation and booming profits as reflected in the current Wall Street hockey sticks, but the" yield shock" which is now baked into the cake. With the other major central banks exiting QE or moving toward the sidelines, there is nothing to stop the law of supply and demand from having its way with bond prices in the quarters ahead. After all, in the US alone there will be $1.8 trillion to be absorbed in the bond pits during FY 2019, reflecting $1.2 trillion of new US Treasury issuance and $600 billion of existing bonds to be dumped by the Fed. 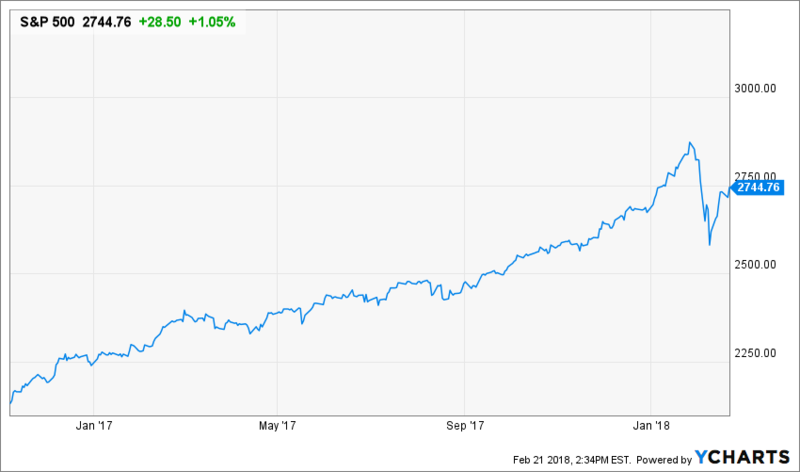 As we demonstrated last week, even a 10-year benchmark UST at a 3.75% yield----which after today's mini-shock is well within sight---- will cost the S&P 500 around $40 per share in higher pre-tax interest payments. Not only is that not "priced-in" to the Wall Street hockey sticks, but neither is its correlate. To wit, the C-suites of corporate America are going to be having a real bad hair day when the carry cost of all the debt they have issued to fund stock buybacks and other financial engineering plays begins to bite them in the rear. Not only will that mean earnings' disappointments, but it is also likely to shut-down the real buy-the-dips engine that lays beneath Wall Street's nine-year bubble. That, of course, is debt-financed stock buybacks. 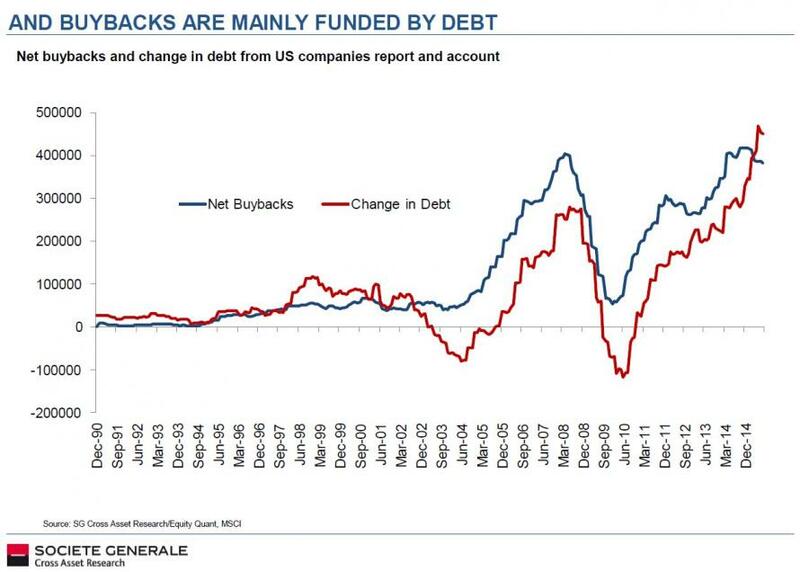 As shown below, debt issuance has matched buybacks on on a dollar for dollar basis since 2009. Thanks to the King of Debt and the complete fiscal betrayal of the Congressional GOP, however, that's about to change. Big time. There is no need to speculate about what happens when the artificial prop of stock buybacks is yanked out from under today's bubblicious markets. 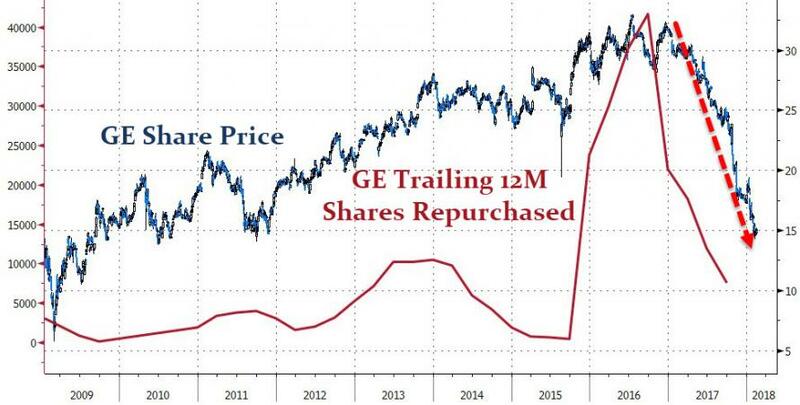 The crony capitalist fools who have been running GE as a stock buyback machine for more than three decades, have now left nothing to the imagination. So this time is very different than the last time that end-of-the-cycle PE multiples hit the high 20s. Back n the year 2000, the Fed had a $500 billion balance sheet and plenty of headroom to temporarily monetize the public debt with nearly reckless abandon. And there was also a 2.3% of GDP fiscal surplus, which minimized UST pressures on the bond pits. Not now. Not with a $4.4 trillion Fed balance sheet going into an unprecedented shrinkage phase and the public debt heading for $35 trillion. Self-evidently, a monetary/fiscal collision of biblical proportions is now rumbling down the pike. That's what makes this time so very different and in such a very not good way.